John M. Schofield had a busy war, rising from lieutenant on leave of absence in the spring of 1861 to Lieutenant-General by the end of the war. 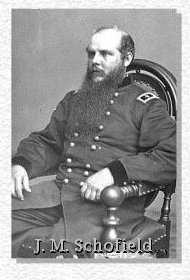 Schofield was Nathaniel Lyon’s mustering officer in April of 1861, adjutant at Wilson’s Creek, commander of the Department of Missouri, corps commander under Sherman on the drive to Atlanta, army commander at the battle of Franklin, TN, and then rejoined Sherman in time to help negotiate the surrender of Joe Johnston’s army after Washington had rejected the original terms. “The Aftermath of the Lawrence Massacre” is Schofield’s rather odd account of the Union reaction in Missouri and Kansas immediately following the bushwhackers’ sack of Lawrence. There is no actual account included of the attack on Lawrence, and Schofield introduces the topic as an aspect of the internecine strife in Union circles in Missouri and Kansas between the “claybanks” (conservatives) and “charcoals” (radicals). Schofield seems to be taking pains to show that he did what he could to blunt the worst of the retribution that Unionists were demanding after Lawrence. He even implies near the end that his moderating of the radicals planned revenge nearly resulted in a civil war within the Civil War –this one between radical and conservative Unionists. Perhaps the most eye-opening aspect of the whole account is his take on the cause of the Lawrence Massacre. While he does not go into the details that any good Missouri Rebel can recite by heart—including the horror of the Kansas City jail collapse that killed or injured many southern ladies and children, driving their bushwhacker men-folk wild with a flaming desire for retribution—Schofield clearly attributes Lawrence to the recent change in Union policy towards these southern hostages. Even more, he reports to his superiors that he warned Ewing that something of the like might happen. Schofield says: “Accordingly I directed General Ewing to adopt and carry out the policy he had indicated, warning him, however, of the retaliation which might be attempted, and that he must be fully prepared to prevent it before commencing such severe measures. Almost immediately after it became known that such policy had been adopted, Quantrill secretly assembled from several of the border counties of Missouri about 300 of his men.” While not as fulsome an admission as a Confederate partisan would prefer, Schofield is essentially agreeing with them. Lyon’s adjutant at Wilson’s Creek, and Union commander of Missouri for much of the war, Schofield’s memoirs are an important addition for anyone interested in Missouri during the war. My impression is that the nature of this quarrel in Missouri was not fully understood at the time in Washington, as General Halleck wrote me that neither of the factions was regarded as really friendly to the President. But my belief is that they were then, as they subsequently proved to be, divided on the Presidential question as well as in State politics; that the conservatives were sincere in their friendship and support of Mr. Lincoln, and desired his renomination, while the radicals were intriguing for Mr. Chase or some other more radical man. This struggle between extreme radicalism and conservatism among the Union people of Missouri was long and bitter, but I have nothing to do with its history beyond the period of my command in that department. It resulted, as is now well known, in the triumph of radicalism in the Republican party, and the consequent final loss of power by that party in the State. Such extremes could not fail to produce a popular revulsion, and it required no great foresight to predict the final result. In reply to your telegram of the 27th, transmitting copy of one received from two influential citizens of Kansas, I beg leave to state some of the facts connected with the horrible massacre at Lawrence, and also relative to the assaults made upon me by a certain class of influential politicians. Since the capture of Vicksburg, a considerable portion of the rebel army in the Mississippi valley has disbanded, and large numbers of men have come back to Missouri, many of them doubtless in the hope of being permitted to remain at their former homes in peace, while some have come under instructions to carry on a guerrilla warfare, and others, men of the worst character, become marauders on their own account, caring nothing for the Union, nor for the rebellion, except as the latter affords them a cloak for their brigandage. Under instructions from the rebel authorities, as I am informed and believe, considerable bands, called “Border Guards,” were organized in the counties of Missouri bordering on Kansas, for the ostensible purpose of protecting those counties from inroads from Kansas, and preventing the slaves of rebels from escaping from Missouri into Kansas. These bands were unquestionably encouraged, fed, and harbored by a very considerable portion of the people of those border counties. Many of those people were in fact the families of these “bushwhackers,” who are brigands of the worst type. Upon the representation of General Ewing and others familiar with the facts, I became satisfied there could be no cure for this evil short of the removal from those counties of all slaves entitled to their freedom, and of the families of all men known to belong to these bands, and others who were known to sympathize with them. Accordingly I directed General Ewing to adopt and carry out the policy he had indicated, warning him, however, of the retaliation which might be attempted, and that he must be fully prepared to prevent it before commencing such severe measures. Almost immediately after it became known that such policy had been adopted, Quantrill secretly assembled from several of the border counties of Missouri about 300 of his men. They met at a preconcerted place of rendezvous near the Kansas line, at about sunset, and immediately marched for Lawrence, which place they reached at daylight the next morning. They sacked and burned the town and murdered the citizens in the most barbarous manner. It is easy to see that any unguarded town in a country where such a number of outlaws can be assembled is liable to a similar fate, if the villains are willing to risk the retribution which must follow. In this case 100 of them have already been slain, and the remainder are hotly pursued in all directions. If there was any fault on the part of General Ewing, it appears to have been in not guarding Lawrence. But of this it was not my purpose to speak. General Ewing and the governor of Kansas have asked for a court of inquiry, and I have sent to the War Department a request that one may be appointed, and I do not wish to anticipate the result of a full investigation. . . . I am officially informed that a large meeting has been held at Leavenworth, in which a resolution was adopted to the effect that the people would assemble at a certain place on the border, on September 8, for the purpose of entering Missouri to search for their stolen property. Efforts have been made by the mayor of Leavenworth to get possession of the ferry at that place, for the purpose of crossing armed parties of citizens into north Missouri. I have strong reasons for believing that the authors of the telegram to you are among those who introduced and obtained the adoption of the Leavenworth resolution, and who are endeavoring to organize a force for the purpose of general retaliation upon Missouri. Those who so deplore my “imbecility” and “incapacity ” are the very men who are endeavoring to bring about a collision between the people of Kansas and the troops under General Ewing’s command. I have not the “capacity” to see the wisdom or justice of permitting an irresponsible mob to enter Missouri for the purpose of retaliation, even for so grievous a wrong as that which Lawrence has suffered. I have increased the force upon the border as far as possible, and no effort has been, or will be, spared to punish the invaders of Kansas, and to prevent such acts in the future. The force there has been all the time far larger than in any other portion of my department, except on the advanced line in Arkansas and the Indian Territory. . . .
P. S. Since writing the above I have received the “Daily Times” newspaper, published at Leavenworth, containing an account of the meeting referred to, and Senator Lane’s speech, which I have the honor to inclose herewith for your information. Sept. 2.— Reached Leavenworth at five o’clock A. M. Stopped at the Planters’ Hotel; was called upon by Governor Carney and several of his political friends. Discussed at much length the condition of affairs in the District of the Border. Carney is an aspirant for the United States Senate. Intends to run against Lane. Desires to kill off Ewing, considering him a formidable rival, or at least a supporter of Lane. Ewing has determined not to be a candidate at the next election, and will not commit himself in support of either Carney or Lane. Desires to keep on good terms with Lane because he thinks Lane will probably be reelected. Carney understands Ewing as supporting Lane, or at least as having withdrawn in Lane’s favor. In fact, Ewing refuses an alliance with Carney. Carney therefore desires to kill Ewing. Lane finds it to his interest to sustain Ewing so long as Schofield commands the department. Ewing is a better man for Lane than any other Schofield would be likely to give him. Lane’s desire is to remove Schofield and get in his place a general who would place Kansas under command of one of Lane’s tools, or a man who could be made one by Lane; therefore Lane defends Ewing and concentrates his attack upon Schofield. Asked and obtained a long private interview with Lane. Went over the whole ground of his hostility to Genl. S[chofield] during the past year. Showed him the injustice he had done Genl. S., and how foolish and unprofitable to himself his hostility had been. He stated with apparent candor that he had bent the whole energies of his soul to the destruction of Genl. S.; had never labored harder to accomplish any object in his life. Said he had been evidently mistaken in the character and principles of Genl. S., and that no man was more ready than he to atone for a fault. We then approached the subject of the invasion of Missouri by people of Kansas. Genl. Lane still adheres to his design of collecting the people at Paola and leading them on an expedition “for the purpose of searching for their stolen property.” He professes his ability to control the people; that he would be answerable, and offered to pledge himself to Genl. S. and the government that they should do nothing beyond that which he declares as the object of the expedition. Lane was informed that Genl. S. would go to Kansas City the next day, and Lane replied that he intended to go also. It was agreed that both should go the next morning and converse with Genl. Ewing on the subject. The same evening Genl. Lane made a public speech in Leavenworth, in which he urged the people to meet at Paola, and assured there that the department and district commanders would not interfere with the proposed expedition; on the contrary, that both would countenance and cooperate with it. He also proclaimed the object to be to lay waste the border counties of Missouri and exterminate the disloyal people. This statement, following an interview on that subject, was calculated to mislead a large number of well-disposed people who would not for a moment think of acting in opposition to military rules, and to greatly increase the number of people who would assemble at Paola, and seriously complicate the difficulty. In the evening had another interview with Gov. Carney and some of his friends. My main object was to secure the full cooperation of the State government in preventing the invasion of Missouri. For this purpose I had to consult to a considerable degree the political views and aims of the governor and his friends. Their object was, of course, to make out of Lane’s project as much capital as possible against him. It was held by many of them that Lane had no serious design of entering Missouri; that he expected, of course, that the military authorities would forbid it; and that he would yield as a military necessity, and thus gain with his people additional ground for condemnation of the department commander, while he had the credit of having done all he possibly could to enable them to “recover their stolen property.” . . . Viewing matters in this light, the governor and his advisers were strongly inclined to the opinion that the surest way of making capital for themselves out of Lane’s move was to let him go on with it, without any interference on their part, confident that it would turn out a grand humbug. . . . After reaching Kansas City and talking with Genl. Ewing, I replied to the governor, accepting the services of as many of his troops as he and Genl. Ewing should deem necessary for the protection of all the towns in Kansas near the border, stating that with Kansas so protected, Genl. Ewing would not only carry out his order for the expulsion of disloyal persons, but also in a short time drive out the guerrillas from his district and restore peace. In addition to this, I wrote the governor a private letter urging him to issue his proclamation discouraging the Paola meeting and warning his people against any attempt to go into Missouri, and informing him I would issue an order forbidding armed men not in the regular military service from crossing the line. Sept. 4.—I received the governor’s reply that he would issue his proclamation as requested, and also asking permission to publish a letter which I had written him on August 29, in reply to one from him regarding these matters. This permission was granted. My order was also published declaring that the militia of Kansas and Missouri would be used only for the defense of their respective States; that they should not pass from one State into the other without express orders from the district commander; that armed bodies of men not belonging to the United States troops, or to the militia placed under the orders of the department commander by the governors of their respective States, should not, under any pretext whatever, pass from one State into the other. In the evening of the 3d I sent a despatch to the general-in-chief [Halleck], informing him that the Paola movement was under the control and guidance of Lane, and that I should not permit them to enter Missouri; that Lane said he would appeal to the President; that I did not apprehend a hostile collision; but that a despatch from the President or the Secretary of War (to Lane) would aid me much in preventing difficulty. If such despatch should be sent, I requested to be informed of its purport. No reply received from the general-in-chief up to this time (1 p.m., Sept. 5). Sept. 6.—Lane failed to meet me at Kansas City, according to agreement. My correspondence with Governor Carney relative to the Lawrence massacre and the Paola movement appeared in the Leavenworth papers of yesterday; also my order forbidding armed citizens from crossing into Missouri. The governor’s proclamation did not appear according to promise; probably he may have decided to defer it until after the Paola meeting, as a means of making capital against Lane. A private letter from one of Governor Carney’s advisers was received yesterday (5th), dated the 3d, but evidently written in the evening of the 4th or morning of the 5th, which indicated that Carney does not intend to publish a proclamation, for the reason that Lane desires to force him to do it. Went to Westport yesterday. Met several of the leading loyal citizens; all agree that Genl. Ewing’s order No. 11 is wise and just—in fact a necessity. I have yet to find the first loyal man in the border counties who condemns it. They are also warm in their support of Genl. Ewing, and deprecate his removal. I am satisfied he is acting wisely and efficiently. . . . The radicals in Missouri condemn him (Ewing) as one of my friends; the conservatives, because he is a Kansas man, and more especially because of his order No. 11, and similar reasons and radical measures. For a time this will weaken me very much, and possibly may cause my overthrow. This risk I must take, because I am satisfied I am doing the best for the public good, and acting according to my instructions from the President. I seem in a fair way to reach one of the positions referred to in the President’s letter of instructions, viz. : that in which both factions will abuse me. According to the President’s standard, this is the only evidence that I will ever have that I am right. It is hardly possible that I will ever reach a point where both will commend me. . . .
Sept. 8.—Went to Independence yesterday, in company with Genl. Ewing; . . . made a few remarks to quite a large assemblage of people, which were well received; was followed by Genl. Ewing in an appropriate speech, which produced a good effect. Have determined to modify General Ewing’s order, or rather he will modify it at my suggestion, so that no property shall be destroyed. I deem the destruction of property unnecessary and useless. The chief evil has resulted from the aid given to guerrillas in the way of information conveyed by disloyal people, and by preparing their food for them. This evil is now removed. Forage and grain cannot be destroyed or carried away to such extent as materially to cripple them. I will as far as possible preserve the property of all loyal people, with the view of permitting them to return as soon as the guerrillas shall be driven out. Property of known rebels will be appropriated as far as possible to the use of the army and loyal people who are made destitute. None will be destroyed. Had a long interview this morning with Mayor Anthony of Leavenworth and a number of influential citizens of that place. Anthony was arrested and sent to this place yesterday by a detective in the employ of Genl. Ewing. The arrest was without authority, and Genl. Ewing promptly discharged the mayor. The object of the citizens was to obtain a revocation of martial law in Leavenworth, and come to a correct understanding as to the relation between the military and civil authorities in that town, so as to prevent difficulty in future. The whole matter was satisfactorily arranged. . . . So far as can be learned, no people have gone from Leavenworth to the Paola meeting, and it is probable the whole affair will amount to nothing. Believing that the trouble here is substantially over, I propose to start for St. Louis to-morrow morning. A regiment of enrolled militia ordered to New Madrid to relieve the 25th Missouri, in order that the latter might go to reinforce General Steele in Arkansas, mutinied after they had gone on board the steamer, brought the boat ashore, and went to their homes. The provost guard of St. Louis was sent to arrest them. News having come of the capture of Little Rock, the two enrolled militia regiments in St. Louis were dismissed, except the mutineers, who were kept at hard labor for some time, and the leaders tried for mutiny. This mutiny was caused by the efforts of the radical papers and politicians, who had for some time openly opposed the organization of the provisional regiments, and encouraged the men to mutiny. I published an order enforcing martial law against all who should incite mutiny among the troops, and through General Halleck obtained the President’s approval of this order, but did not find it necessary to make that approval public until it was made known by the President himself. I inclose herewith a copy of an order which I have found it necessary to publish and enforce. The revolutionary faction which has so long been striving to gain the ascendancy in Missouri, particularly in St. Louis, to overthrow the present State government and change the policy of the national administration, has at length succeeded so far as to produce open mutiny of one of the militia regiments and serious difficulties in others. I inclose a number of slips from papers published in Missouri, to show the extent to which this factious opposition to the government has been carried. The effect already produced is but natural; and the ultimate effect will be disastrous in the extreme, unless a strong remedy be applied speedily. to delay it longer. It is barely possible that I may not have to enforce the order against the public press. They may yield without the application of force; but I do not expect it. The tone of some of their articles since the publication of the order indicates a determination to wage the war which they have begun to the bitter end. This determination is based upon the belief that the President will not sustain me in any such measures as those contemplated in the order. A distinct approval by the President of my proposed action, and a knowledge of the fact here, would end the whole matter at once. I desire, if possible, to have such approval before taking action in any individual case. Indeed, I believe such approval would prevent the necessity for the use of force. It is difficult, I am aware, for any one at a distance to believe that such measures can be necessary against men and papers who claim to be “radically loyal.” The fact is, they are “loyal” only to their “radical” theories, and are so “radical” that they cannot possibly be “loyal” to the government. . . . These men were styled “revolutionists,” not without sufficient cause. 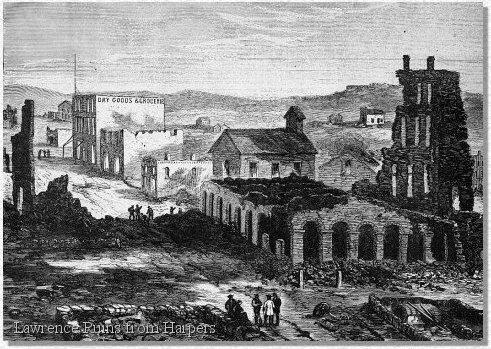 It was currently reported that they had in 1861 conceived the elevation of Fremont to a dictatorship. In 1862, and again in 1863, they invented a scheme for the violent overthrow of the provisional State government and the existing national administration in Missouri. The first act of the program was to seize and imprison Governor Gamble and me. In 1862 some of them committed the indiscretion of confiding their plans to General Frank P. Blair, Jr., who at once warned me of it, but refused to give me the names of his informers or of the leaders. He said he could not do so without breach of confidence, but that he had informed them that he should give me warning and expose the individuals if any further steps were taken. Here the matter ended. In 1863 I received warning through the guard stationed at my residence in the suburbs of the city, with which the revolutionists had the folly to tamper in their efforts to spread disaffection among my troops. This discovery, and the premature mutiny of the regiment ordered to New Madrid, nipped the plot in the bud. I refer to the circumstances now only to show that I was not unjust in my denunciation of the “revolutionary faction” in Missouri.
. . . Neither faction in Missouri is really friendly to the President and administration; but each is striving to destroy the other, regardless of all other considerations. In their mutual hatred they seem to have lost all sense of the perils of the country and all sentiment of national patriotism. Every possible effort should be made to allay this bitter party strife in that State.
. . . I feel compelled to say that I believe you are not altogether right in your information about the factions in Missouri. If the so-called “claybank” faction are not altogether friendly to the President and administration, I have not been able to discover it. The men who now sustain me are the same who rallied round Lyon and sustained the government in the dark days of 1861, while the leaders of the present “charcoal” faction stood back until the danger was past. I believe I have carried out my instructions as literally as possible, yet I have received a reasonable support from one faction and the most violent opposition from the other. I am willing to pledge my official position that those who support me now will support me in the execution of any policy the President may order. They are the real friends of the government. It is impossible for me to be blind to this fact, notwithstanding the existence, to some extent, of the factional feeling to which you allude. The improvement produced by the order was so decided that publication of the President’s approval was thought unnecessary. It only became public through his letter of October l, 1863, of which he gave a copy to the radical delegation. In September the governor of Missouri placed all the militia of the State, including those not in active service, under my command. I published orders intended to control their action and prevent interference with political meetings; also to secure freedom of voting at the coming election in November. Several militia officers guilty of such interference were dismissed, which produced a wholesome effect.